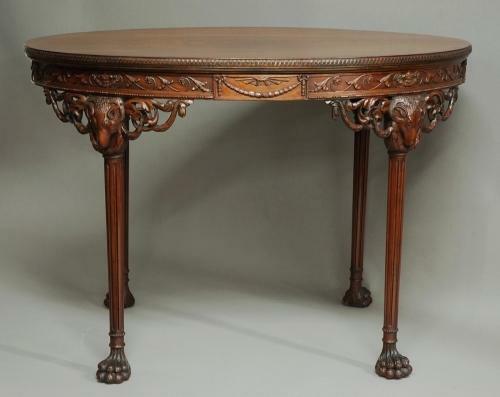 This table consists of a superb quality figured and cross banded mahogany top with a sophisticated carved edge. The recessed frieze consists of carved decoration of various design - the central panels between the legs have carved fan and swag designs, the other panels comprise of scrolling flowers and foliage decoration and under the panels is a ball bead carved moulding. To the top of each leg is a finely carved rams head with foliate and swag decoration supporting tapered and fluted legs which lead down to a carved ball collar terminating with bold hairy paw feet.